New Bookings Only. Not Combinable with any other coupon codes. Excludes Transatlantic, Transpacific, or Repositioning cruises. May be delivered as a shipboard credit for the cabin. Will automatically be applied to applicable online reservations. Book an Oceanview or higher on a 7+ night sailing and also receive: Pre-Paid Gratuities for Two New Bookings Only. Not Combinable with any other coupon codes. Excludes Transatlantic, Transpacific, or Repositioning cruises. May be delivered as a shipboard credit for the cabin. Will automatically be applied to applicable online reservations. Not valid for guarantee cabins (categories: IX, OX, BX, or MX). $50 USD per port shore excursion credit is per stateroom. Credit has no monetary value and is nonrefundable. In the event a port of call or excursion is missed, for any reason, no refund or credit will be issued. Shore excursion credit is applicable for each port, including debarkation port, and is not transferable to other ports. Use the credit or lose it. Does not include embarkation ports. Overnight stays count as one port, except Bermuda sailings which can receive up to 3 individual days of shore excursion credit. Shore excursion credit can be redeemed by calling 1-866-625-1167 or booking onboard. For the guests that book their excursions online; they are charged full retail for the excursions and the discount will be applied onboard in the form of a credit to their onboard account. Not valid for guarantee cabins (categories: IX, OX, BX, or MX). Package prices are subject to change. Guest is responsible for 20% gratuities on the retail value of the Specialty Dining Package prior to cruise. 20% gratuities on the retail value of the Specialty Dining Package are included when booking through the Australia office. Packages are based on a per meal basis. Applicable to guests 1-2 on the reservation. Dining package is applicable to guest ages 2 and older. 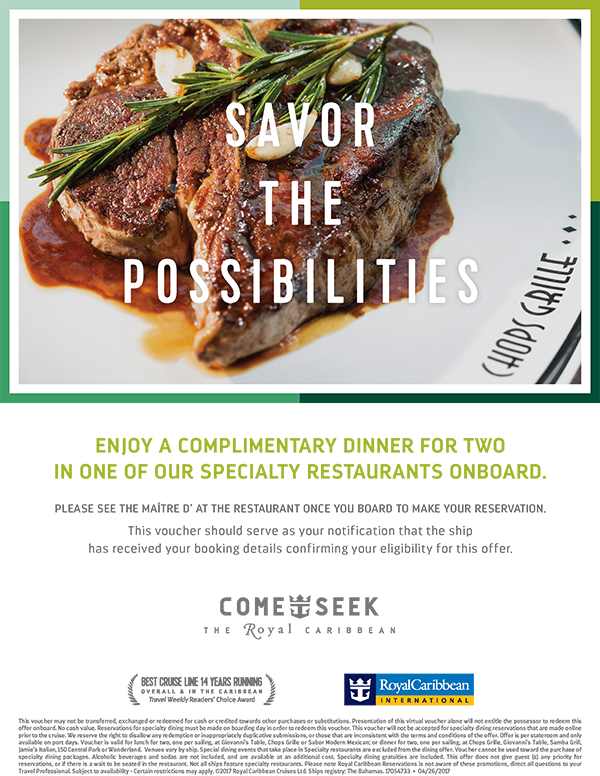 Any Harvest Caye bars, restaurants, or venues, Food Republic, The Bake Shop, Ice Cream Bar, Gelato, specialty items in the Asian restaurant, Special Occasion/Holiday menus (New Year's, Christmas, etc. ), Jazz Brunch, Wine Lovers and Murder Mystery lunches, and beverages are not included as part of the Specialty Dining Packages. You may choose to dine in the following venues as part of your Specialty Dining Package for the corresponding upcharges: Cabaret ($15 USD), For the Record ($15 USD), Ocean Blue ($10 USD), Bayamo ($10 USD), Cirque Dreams ($10 USD regular seats/$15 USD premium seats/$35 USD VIP seating on Breakaway), Sushi Bar ($7 USD), Pincho Tapas Bar ($7 USD), and Raw Bar ($7 USD). Specialty Dining Packages include one main course per person at Cagney's and Le Bistro restaurants. Additional main courses will be charged at the a la carte price listed on the menu. There is no minimum or maximum to the number of meals that can be redeemed in a day, however each meal is counted towards the package. Not valid for guarantee cabins (categories: IX, OX, BX, or MX). Applicable to guests 1-2 on the reservation. Guests 1-2 regardless of age will receive the Premium Plus Beverage Package. However, guests under the age of 21 at the time of sailing, may not consume alcoholic beverages. Eligible guests are entitled to two beverages per person per transaction. Includes all beverages by the glass. Beverage selection is subject to change onboard. Includes select wines by the bottle when dining. Includes fountain soda, freshly squeezed juice, bottled water (flat and sparkling), non-alcoholic beer, and specialty coffee (specialty coffee inclusion shall be limited to dining rooms only). A 40% discount will be given on bottles of wine (champagne and sparkling included), Wine and Spirit Experiences, tastings or Flights purchased on board. Offer is not applicable at Harvest Caye bars, restaurants, or venues. Does not include: Wine and Spirit Experiences, tastings or Flights, specialty coffee outside of the restaurants, room service, mini bar purchases, wine dispenser or vending machines. Guest's check may reflect applicable VAT and/or taxes for certain ports or itineraries. Guest is responsible for 20% gratuities on the retail value of the Premium Plus Beverage Package ($5.80 USD per person per day) prior to cruise. Retail value of Premium Plus Beverage Package is $29.00 USD per person per day. Package price is subject to change. 20% gratuities on the retail value of the Premium Plus Beverage Package are included when booking through the Australia office. When booking through the Australia office, gratuities related to beverage package are included. No substitute for package if guest cannot consume all beverages included. Not valid for guarantee cabins (categories: IX, OX, BX, or MX). Premium Beverage Package is applicable to all qualified sailings excluding Pride of America and 3-6 night Sun & Sky sailings. Applicable to guests 1-2 on the reservation. Guest must be at least 21 years of age at time of sailing to qualify for the Premium Beverage Package. Guests under 21 will receive the soda package. Eligible guests are entitled to two beverages per person per transaction. Includes a variety of spirits and cocktails, wines by the glass and bottled or draft beer up to $15 USD retail price. Includes fountain soda, juice, and non-alcoholic beer. A 20% discount will be given on bottles of wine (champagne and sparkling included), Wine and Spirit Experiences, tastings or Flights purchased on board. Offer is not applicable at Harvest Caye bars, restaurants, or venues. Does not include: Wine and Spirit Experiences, tastings or Flights, Starbucks, Ice Bars, room service, package sales, bottled water, ship specific promotions or beer buckets, designated super premium brands (subject to change), bottled wine, mini bar purchases, fresh squeezed juices, Lavazza coffee beverages, wine dispenser, energy drinks or vending machines. Guest who receive the Soda Package may obtain fountain soda at any bar, lounge or restaurant throughout the duration of the cruise, excluding Harvest Caye bars, restaurants, or venues. Guest's check may reflect applicable VAT and/or taxes for certain ports or itineraries. Guest is responsible for 20% gratuities on the retail value of the Premium Beverage Package ($19.80 USD per person per day) and/or Soda Package ($1.59 USD per person per day) prior to cruise. Retail value of Premium Beverage Package is $99.00 USD per person per day. Package price is subject to change. Retail value of the Adult Soda Package is $7.95 USD per person per day. Package price is subject to change. 20% gratuities on the retail value of the Premium Beverage Package and/or Soda Package are included when booking through the Australia office. When booking through the Australia office, gratuities related to beverage and soda packages are included. Prepaid gratuities (hotel service charges): Holland America Line pre-pays room gratuities on behalf of guests. Gratuities for bar, dining room wine accounts, or spa/salon services are not included. Complimentary Gratuities Offer applies to two guests per stateroom and provides for prepaid stateroom, waiter, assistant waiter and head waiter gratuities in the amount suggested by Royal Caribbean guidelines. Applicable to oceanview and above. Combinable with Traditional Dining Only and may be delivered as Shipboard Credit. Your credit can be used for everything from dinners to movies and drinks. When you book online with Cruise Deals by CruCon Cruise Outlet you will also receive the following shipboard credit. Not combinable with any other discount, promotion or coupon. Some restrictions apply. Based on double occupancy. All of our advertised cruise rates are in US dollars are per person based on double occupancy, include port charges and are capacity controlled. Taxes, fees and port expenses additional. Restrictions apply. Call for details. Itineraries are provided for reference only. Please verify itinerary on your individual sailing before booking your cruise. Shipboard Credit (if offered), is per cabin not per person, unless otherwise stated in ad. Pre-Paid Gratuities (if offered) are for the first two people in the stateroom only. We make every attempt to keep the website up to date but hot deals sell out very quickly. Rates can be increased at any time by the cruise lines until your cruise is under deposit. We are not responsible for typographical errors that from time to time may occur. We apologize for any confusion that these may cause and attempt to fix these as soon as they are identified. 81 Whittier Hwy, Moultonborough, NH 03254. Florida Seller of Travel Registration No. ST41102; California Registration No. (CST) 2097958-70 (Registration as Seller of Travel does not constitute approval by the State of California); Washington Registration No. 604165701 and Iowa Registration No. 1404. Pre-Paid Service Charges are applicable to the 1st and 2nd guest in the stateroom 3 years of age and up. Applicable to guests 1-2 on reservation. Offer not applicable to guests 3-8. Guests are responsible for onboard gratuities applicable to all other shipboard purchases. Excludes Transatlantics, Transpacifics, & Repositioning sailings.